The annual meeting of the TENNESSEE MUNICIPAL LEAGUE (TML) was held June 6-9, 2015 at the Renaissance Nashville Convention Center. We enjoyed visiting with our clients and friends at the Ice Cream Parlor. certainly hope to see you during this year’s event! 2013 Best Drinking Water Plant Operations Award from the KWWOA Western Chapter. What outstanding achievements! Congratulations HWEA! Industrial User Permits have been revised and issued. A 2015 CDBG application was submitted for a Sewer System Rehabilitation. Award announcements are expected to be made early Fall. Work on a Sewer Master Plan is underway. The Automatic Read Water Meter System Replacement project is proceeding with 4% of meters installed. Baird Contracting Co., Inc. is the Contractor. The Capacity Assessment Plan and Sewer System Evaluation Survey Work Plan are complete and approved by EPA as part of the Administrative Order of Consent. The Sanitary Sewer Overflow Response Plan and Fats, Oils and Grease Program have been submitted to the EPA. Draft copies are complete for the Continuing Sewer System Assessment Program, Gravity Line Preventive Maintenance Program and Infrastructure Rehabilitation Program. Survey work is complete and design work is underway for the Holiday Drive and Lantana Estates Waterline Replacement Project, 19,000 L.F. of 6-inch water line, is underway. well as other punch list items. The $10,269,127 plant is expected to be complete July 2015. Bids for the Hwy 27 North White Oak Road sewer lines were received on March 26, 2015 with the low bidder Norris Brothers Excavating, LLC at $750,785.20. Contracts have been assembled and forwarded to the Contractor. We prepared an exhibit and cost estimate of proposed water system improvements in the Pitts Gap area which are proposed to be funded by a grant from the Abandoned Mine Lands Program. Design plans for the Highway 127/62 utility relocation were submitted in June 2013 and have an unofficial let date. An engineering report for an ARC grant application has been submitted for a 12-inch water transmission line from FCUD’s Clarkrange Tank to the Industrial Park. The Owner is in the process of acquiring additional property for a new 200,000 gallon elevated water storage tank at Clarkrange. We continue to assist Halls with the Pretreatment Program. 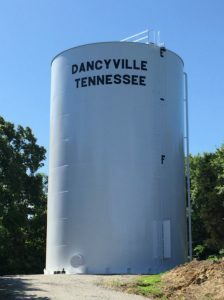 The Dancyville Standpipe Repair and Repainting project with Preferred Sandblasting and Painting, the low bidder, at $114,000 is complete and closed out. The $10,268,077 North Wastewater Treatment Plant Expansion Project will expand the peak flow capacity from 15.0 MGD to 25.5 MGD. 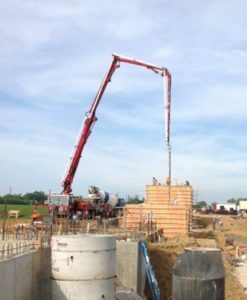 The Clarifier Wall Pours are complete and the contractor is currently working on the effluent trough. The Janalee Drive SPS Renovation is complete with Owner considering adding a small amount of additional work before closing out the project. The project involved the complete renovation of the Janalee Drive sewage pumping station, which was constructed in the 1950’s, including replacement of the extended shaft style pumps with three variable speed 150 HP Flygt dry pit submersible pumps, replacement of all valves and discharge piping, installation of a new 24-inch PVC force main, construction of a new flowmeter pit, complete replacement of the HVAC system and new electrical service. $90,747. A pre-construction meeting was held in April 2015. Commence work order has been delayed pending metal building submittals. Proposals were received in order to select a manufacturer for a 4.0 MGD Membrane Filtration System to be installed at the South Water Treatment Plant. GE/Zenon has been selected as the Membrane Filtration System Manufacturer. 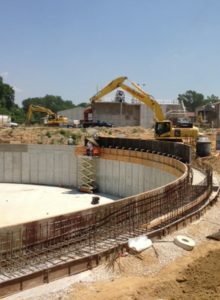 This project, which is currently under design, includes construction of a new flash mix structure, solids contact clarifier, membrane filtration building, 24-inch raw waterline, and 24-inch effluent force main for the South Wastewater Treatment Plant. Painting and renovation of the 500,000 gallon Frontier Water Storage Tank was awarded to Tank Pro, Inc. of Northport, Alabama with the low bid being $491,667. Lastly, a final report was submitted to the Owner for the Atkinson Park Sewer Study which includes the evaluation of several sewage pumping stations including recommendations for long term and short term improvements to the Henderson Water Utility’s wastewater collection system. A design kick-of meeting was held early June and the Owner has requested design for one pumping station renovation, one new pumping station, replacement of existing force mains, and 1,500 L.F. of gravity sewer at an estimated construction cost of $2.2M. Bids for the $525,000 CDBG Sewer Rehab project were received with Dynamic Construction of Gordonsville, Tennessee being the low bidder at $426,820. This project includes replacement of 5,000 L.F. of clay and concrete gravity sewer by pipe bursting methods. The Appalachian Regional Commission awarded funding for a joint project initiated by Lewis County and Hohenwald that extends a 6-inch water line approximately 28,000 L.F. along Summertown Hwy. In addition to ARC funding, a $260,000 SRF Drinking Water Loan was requested including 25% Principal Forgiveness. Plans and Specifications are complete and ready to be submitted to appropriate agencies after the environmental review is complete. The design of the Highway 412 East Street lighting project is complete and approved by TDOT. This project consists of approximately one mile of street lighting along Highway 412 east of Hohenwald. The Owner is implementing the construction in-house. Construction on Phase II Priority No. 2 Sewer Rehabilitation Project continues with 13 of 14 tasks complete with paving remaining. Survey work is complete for additional tasks related to the Sewer Rehabilitation Priority No. 3 and new Priority No. 4. Final Plans, Specifications, and easements for the U.S. Highway 41A water line project, which consists of approximately 15,300 L.F. of 16-inch water line to increase flow and pressure at the Interstate 24 interchange, have been submitted to the Owner. The Regional Facility Plan for the Hammond Wood Wastewater Treatment Plant was submitted to the KDOW and a Public Hearing was conducted April 9. The final version of the Water Master Plan has been submitted to the Owner for review. We are currently assisting the Owner with ongoing water system modeling. An application for a 2015 CDBG project was submitted. Funding is expected to be announced November 2015. An application for a TDEC Energy Grant has submitted for the replacement of two high service pumps at the Water Treatment Plant. Funding is expected to be announced this summer. A Facility Plan Amendment related to improvements to the Miller Avenue Wastewater Treatment Plant was submitted to SRF. A study at the Miller Avenue Wastewater Treatment Plant is underway to evaluate the headworks. The study will look at the screening and grit removal systems as well as mixing in the aeration basins. A preliminary engineering study of the Lewisburg Water Treatment Plant related to necessary improvements for continued use to meet future demands and to provide additional improvements related to reduction of disinfection byproducts has been submitted to the Owner for review. A Corrective Action Plan and Operation and Maintenance Plan were submitted to EPA for the Cornersville WWTP which is owned and operated by Lewisburg. Plans and Specifications for the State Route 50/431 Utility Relocation have been submitted to TDOT for review. A 2015 CDBG application was submitted for a Sewer System Rehabilitation of Basin No. 5. Work for the Water Production Upgrades and Electrical Renovations project is progressing. Electric work continues and Pump #3 and #2 have been installed and are running. Pump #1 is scheduled to start up soon. The completion date is scheduled for September 8, 2015 but if progress continues at the same pace, completion could be as early as July 2015. J. Cumby Construction is the Contractor on this project. A 2015 CDBG application was submitted for a Sewer System Rehabilitation project and announcements are expected to be made early Fall. Bids for the new 700 HP Raw Water Pump were received with Fairbanks Morse being the low bidder at $229,661; Southern Sales will provide installation and starter switchout at $118,559.85. Start up and completion are expected in July 2015. The SR 52 Utility Relocation Project has a letting date of July 10, 2015. The WWTP Nutrient Optimization Sampling Plan is prepared and ready to submit to TDEC pending Owner approval. The field study for the Madison Square Feasibility Study is complete and has been submitted to the Owner for review. Water Quality Modeling work is underway to determine the impacts of a reconfigured effluent discharge concept. Work is entering the intensive field sampling phase. The design of 15,876 L.F. of the 16-inch North Transmission Line is complete and submitted to KY DOW. Construction of the Wallace Park Sewer Separation project is nearing completion with all new lines installed. The Contractor is working on paving and services. Bids for the Cook Street Sewer Basin Storage Facilities were received on April 16, 2015 with Colson Excavating being the low bidder at $5298,787. A pre-construction meeting was held June 10th. Construction is scheduled to begin July 6th. A sewer master plan study is underway. This will provide an orderly map for the City as the sewer system is developed. Industrial User Permits have been revised incorporating Sewer Use Ordinance Requirements and other state recommendations. A CDBG application was submitted for the 2015 funding cycle and will focus on Raw Water Intake Improvements. Ripley is currently awaiting their NPDES Permit Renewal and new Pass Through Limits. Once the new Pass Through Limits are received, the local limits will be re-evaluated and submitted to the State for approval. We continue to assist the client with the preparation of Monthly Discharge Monitoring Reports (DMR’s). Savannah has revised the Industrial User Permits incorporating the new Sewer Use Ordinance requirements. Plans and Specifications for the State Route 128 Utility Relocation have been submitted to TDOT and the project has a July 10, 2015 letting. Bids were opened on May 28, 2015 for the WTP Gravity Filter Renovation with Ronald Franks being the low bidder at $98,837. Work is expected to begin August 2015. Revised permits have been submitted to permitted Industrial Users for their review. A CDBG application was submitted for the 2015 cycle to focus on Sewer System Rehabilitation. Design of the Midland Road/North Main Street Sewer Project is complete consisting of approximately 2,800 L.F. of new 8 and 10-inch gravity sewer. The Owner is constructing this project using in house forces. Design is complete and plans and specifications have been submitted to TDEC for review for the renovation of the 2.16 MGD SBR Wastewater Treatment Plant. Route 1 for the Water Meter Replacement project is underway with approximately 80% of meters installed. Completion is expected to be August 16, 2015. Construction on the Seneker Lane Water Line Extension, funded by a 2013 CDBG, is complete and is being closed out. The low bidder was Merkel Brothers Construction, Inc. at $309,102. Utility line relocation plans for the I-69, Phase II & III as well as State Route 5 have been completed and are awaiting TDOT’s letting. Work on the Water Treatment Plant Clearwell is underway with the clearwell slab place in June. A completion date, for the $697,900 project, is scheduled for September 2015. BAM 2 is the Contractor for the WWTP Digester Renovation project. The first digester started up in early June and the second digester installation has begun. A completion date is scheduled for July 18, 2015. Design is complete and plans and specifications have been submitted to TDEC for review on the water and sewer extension on Reelfoot Avenue to serve commercial growth.